In celebration of its 60th year, the University of the Philippines’ Department of Speech Communication and Theatre Arts launches its lecture series featuring faculty members, scholars, experts, and practitioners from the Philippines and abroad whose research or creative projects revolve around speech communication, theatre arts, and performance studies. 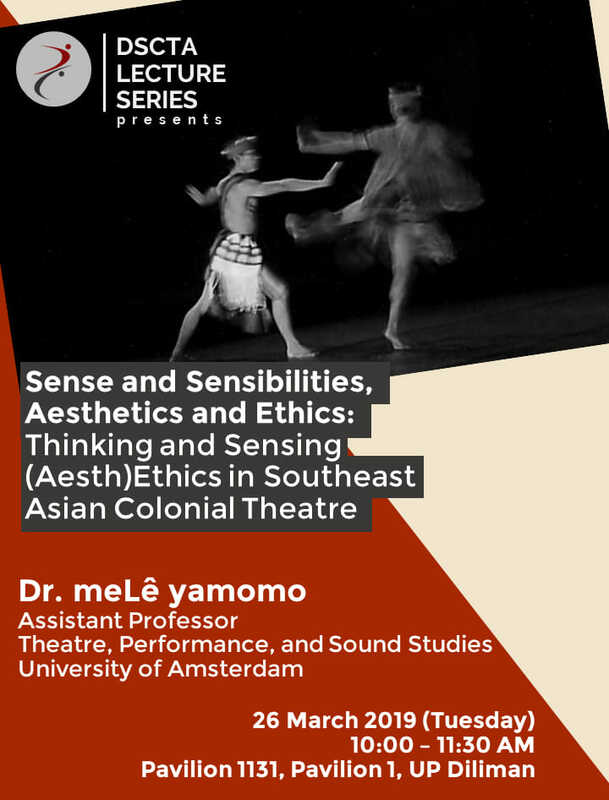 The fourth lecture will be delivered by dr. meLê yamomo with the title, Sense and Sensibilities, Aesthetics and Ethics: Thinking and Sensing (Aesth)Ethics in Southeast Asian Colonial Theatre. See you on the 26th of March, 2019, 10AM at Pavilion 1131, Pavilion 1, University of the Philippines Diliman. This event is free and open to the public, especially to researchers interested in performance and theatre. 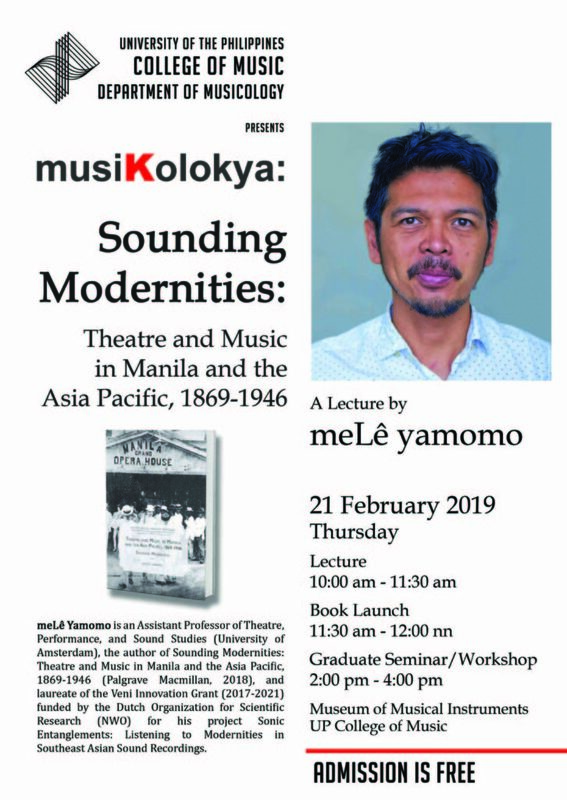 You are cordially invited to the Philippine launch of dr. meLê yamomo’s book, »Sounding Modernities: Theatre and Music in Manila and the Asia Pacific, 1869-1946« on 21 February at the University of the Philippines Diliman-College of Music. A limited number of discounted copies of the book will be available during the launch. Attendees will also receive Palgrave Macmillan discount coupons that can be used for online purchases of the book. Special thanks to Prof. Patricia Brillantes Silvestre and the Dept. of Musicology for making this event possible. The arrival of modernity is often hailed in visual terms, but not as much as with the heraldry of its concomitant proliferation of sound, nor in how the modern society dealt and organized what they were hearing. The lecture inquires into the process of ‘acoustemology’ (or acoustic epistemology, Steven Feld 1996). 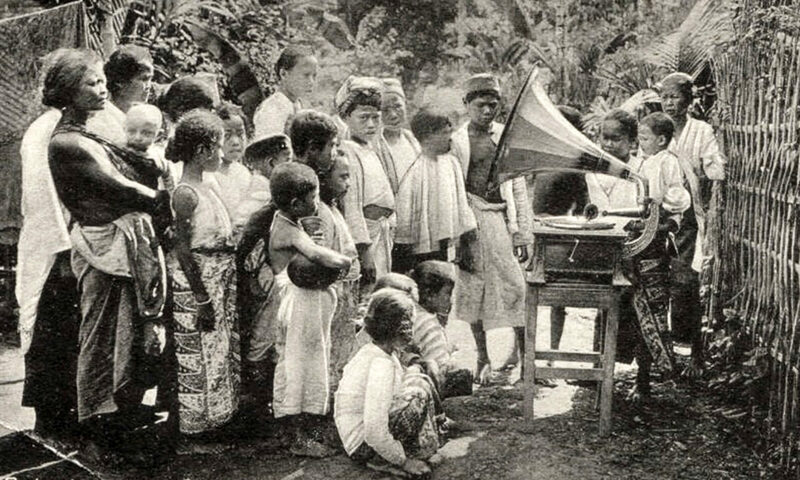 What kind of ‘acoustemes’ do hearing and listening reveal in nineteenth-century modernity and the modern epistemologies of race in the colonial spaces? To understand how modernity and the volatile imagination of race were imagined, heard and embodied, yamomo theoretically reflects on the intersections of sound studies, musicology and performance studies. By synaesthetically comparing Hans Belting’s image theory (2001, 2005) into an Anthropology of Sound, yamomo argues that the sound of modernity is inextricably intertwined with its mediated form (music) and its (racialized) embodiment. This theory also proposes the concept of the ‘sonus‘ to separate the materiality of sound from its epistemological construction. The lecture will examine the intersection between sound and modernity in dramatic and musical performance in Manila and the Asia-Pacific between 1869 and 1948. During this period, tolerant political regimes resulted in the globalization of capitalist relations and the improvement of transcontinental travel and worldwide communication. This allowed modern modes of theatre and music consumption to instigate the uniformization of cultural products and processes, while simultaneously fragmenting societies into distinct identities, institutions, and nascent nation-states. Taking the performing bodies of migrant musicians as the locus of sound, yamomo argues that the global movement of acoustic modernities was replicated and diversified through its multiple subjectivities within empire, nation, and individual agencies. It traces the arrival of European travelling music and theatre companies in Asia which re-casted listening into an act of modern cultural consumption, and follows the migration of Manila musicians as they engaged in the modernization project of the neighboring Asian cities. 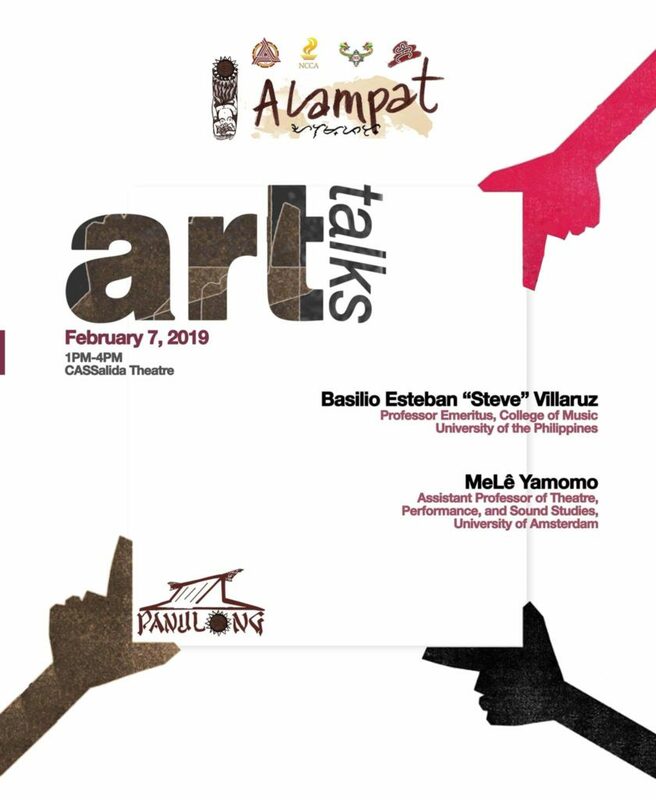 As part of its Art Talks Series, the Iligan Institute of Technology of the Mindanao State University will facilitate a dialogue between the community and two (2) celebrated keynote speakers, meLê yamomo (for music) and Esteban Villaruz (for dance). Considered pillars of the arts and culture in Mindanao and the country, the speakers fulfill this year’s Alampat theme – Panulong: ”Asserting Identities, Reclaiming Place” in an engaging TED-Ex-like dialogue. The event is scheduled on 7 February 2018 at the CASSalida Theatre. Carolyn Birdsall and Anette Hoffmann are organizing a two-day workshop that brings together an interdisciplinary group invested in theoretically-informed, connective histories about modern aurality, race and archival dynamics. With the workshop we seek to facilitate a conversation in the Netherlands and to start building an international network for critical, decolonial research on sound cultural histories and archival practices. In a short presentation entitled, “Speaking of Sound Archive: Audio Interviews of the Vienna Phonogram Archivists”, meLê yamomo will be presenting a preview of an episode of the podcast “Sonic Entanglements”. The workshop will be held on 10-11 December 2018 at the University of Amsterdam – University Library. Click here for more information. For this year’s International Association for the Study of Popular Music (Germany-Austria-Switzerland chapter) Conference, we present a panel entitled, “Asia as Method” in Popular Music Studies. This panel aims to foreground negotiations of our individual positions as music scholars in the light of ongoing public and disciplinary rearrangements of academic engagement with East and South East Asian popular musics. The panel consists of Dr. Citra Aryandari (ethnomusicologist, performance scholar, filmmaker; Institut Seni Indonesia/Indonesian Academy of the Arts Yogyakarta), Dr. Oliver Seibt (cultural musicologist, German working immigrant to the Netherlands, Japanophile; University of Amsterdam), Dr. Barbara Titus (cultural musicologist, self-declared cosmopolitan, hence privileged in researching South African and Indonesian musics; University of Amsterdam), and Dr. meLê yamomo (performance and sound scholar-artist; University of Amsterdam). To what extent has knowledge about Asian (popular) music been conceived and acquired for European and North-American (scholarly) needs, and to what extent should these needs be decentered? How can and do scholars identifying themselves as “non-Asian” (re)position themselves as researchers of Asian music in the increasingly strong inter-Asian scholarly networks and exchanges and constellations of knowledge, like the Inter-Asia Cultural Studies Society or the Inter-Asian Popular Music Studies Group? What are the implications of proposing “Asia as Method” (Chen 2010)? Does the study of, for instance, Berlin post-punk music using an Asian theoretical framework count as Asian studies? In consciously engaging the performativity of the conference panel presentation, we reflect on the uninterrogated presumptions and socialized norms that are often rendered invisible by this social performance genre. At a disciplinary level, standardized use of rhetoric and scholastic language is expected in the scholar’s exposition of academic knowledge. Concomitantly, the audience brings into this social event (unexamined) expectations of how the knowledge being presented intersects with gender, race, class, and “forms” of knowledge of the speaker. 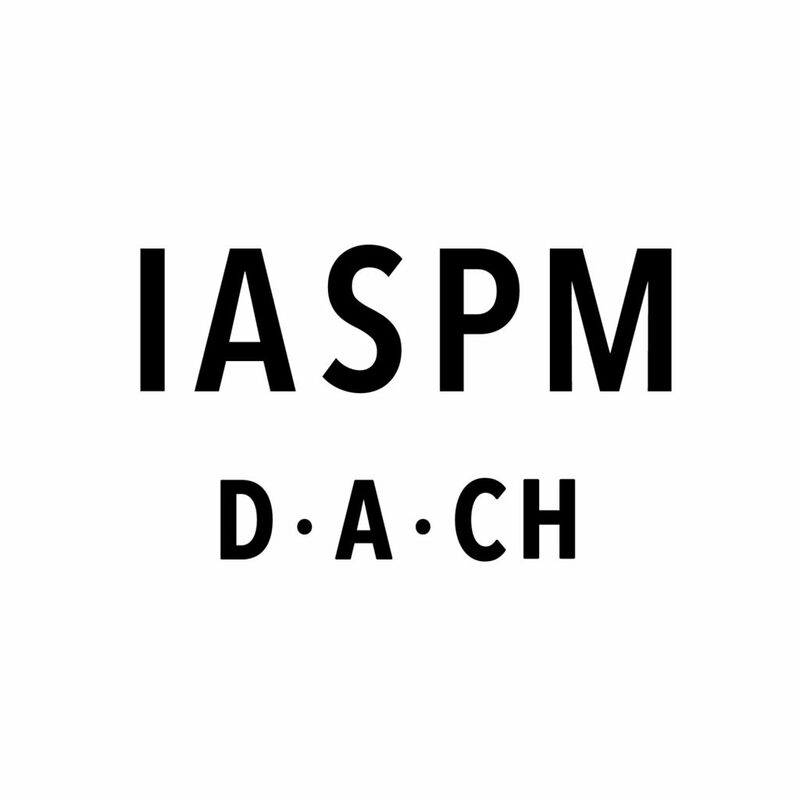 IASPM-DACH 2018 Conference will happen on 18-20 October and will be hosted by Universität Bern. Listen to the short podcast overview of the conference here. Watch our panel performance/presentation here. 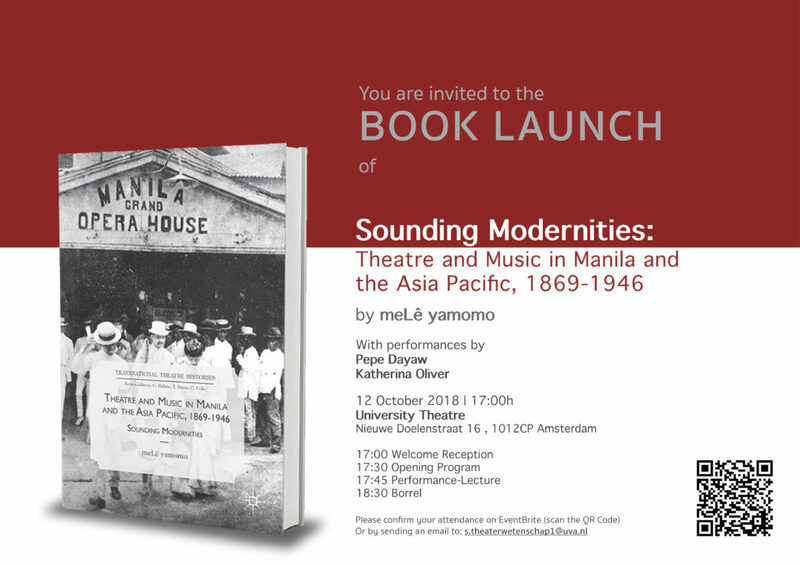 We are very happy to announce that dr. meLê yamomo’s book, »Sounding Modernities: Theatre and Music in Manila and the Asia Pacific, 1869-1946« is now officially out! We would like to cordially invite you to a small gathering of friends to celebrate the launching of the book. This will take place on 12 October at the University Theatre in Amsterdam (Nieuwe Doelenstraat 16, 1012CP Amsterdam). The welcome reception is at 17:00. The program starts at 17:30 with performances from guest artists. A modest borrel will be served afterwards. Carolyn Birdsall will be moderating a roundtable panel at the 2018 EYE International Conference entitled “Activating Audio Collections”. The EYE International Conference 2018 will take place at EYE-Amsterdam from Saturday 26 May to Tuesday 29 May 2018. The discussion takes as its departure point recent strategies and challenges concerning access and attempts at ‘activating’ audio collections. How are stakeholders involved? Which role do artists play in featuring archival material? What is the potential role of researchers in initiatives, such as Europeana Sounds? What kinds of specific possibilities or problems appear with audio materials? What kinds of contextualisations are necessary for recorded audio? And what kinds of ethical considerations need to be taken into account? How do current trends at working interdisciplinarily generate new strategies and forms of collaborations in creating access and re-using the collections? How can gender and queer history be mediated by these archives? How can historic media materials reframe our understandings of national and colonial histories? The roundtable participants bring expertise of archives in different cultural contexts and have experience with work as researchers and artists using audio collections and/or promoting access. Carolyn Birdsall (moderator) is Assistant Professor of Media Studies at the University of Amsterdam. She teaches in the P&P programme, and her current research examines the early history of radio archiving in and beyond Europe. John Ashley Burgoyne is Lecturer in Computational Musicology at the University of Amsterdam. He is the Project Leader on Hooked on Music, a music experiment and game that has now been played over 3 million times worldwide. Currently he is co-editing the new Oxford Handbook on Music Corpus Analysis. Ricarda Franzen is Lecturer in Theatre Studies at the University of Amsterdam, and coordinates the programme of the MA Dramaturgy. Her doctoral research explores the history, contexts and possible uses of theatre sound archives. As a Dramaturge for radio plays, she has researched archival material for re-use in radio drama narratives. Jennifer Hsieh is Anthropologist and Postdoctoral Researcher. She is currently completing a study entitled From Festival to Decibel: Making Noise in Urban Taiwan, which investigates the technological, bureaucratic, and informal practices underlying the production of environmental noise as a regulatory object in Taiwan, from the Japanese colonial period to the present. Gregory Markus is Project Leader at the Netherlands Institute for Sound and Vision, where he runs the RE:VIVE initiative, focused on connecting the worlds of electronic music and cultural heritage developing new, simple and creative methods to present collections and increase awareness and re-use of open, digitized heritage collections. meLê yamomo is Assistant Professor of Theatre Studies at the University of Amsterdam. He holds a PhD in Theatre/Musicology from the Ludwig-Maximilians-Universität Munich, and is also a Theatre Director and Composer. His current research project is entitled Sonic Entanglements: Listening to Modernities in Southeast Asian Sound Recordings (NWO-Veni, 2017-2021). 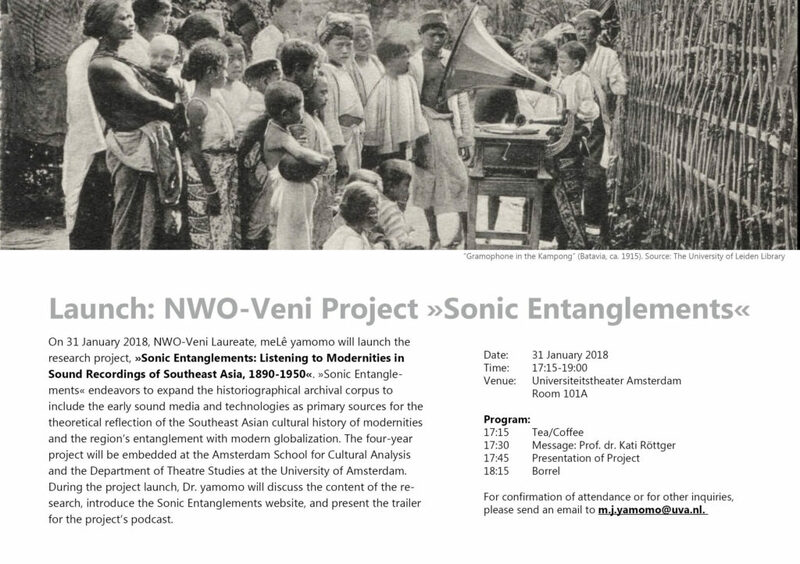 On 31 January 2018, NWO-Veni Laureate, meLê yamomo will launch the research project, »Sonic Entanglements: Listening to Modernities in Sound Recordings of Southeast Asia, 1890-1950«. »Sonic Entanglements« endeavors to expand the historiographical archival corpus to include the early sound media and technologies as primary sources for the theoretical reflection of the Southeast Asian cultural history of modernities and the region’s entanglement with modern globalization. The four-year project is embedded at the Amsterdam School for Cultural Analysis and the Department of Theatre Studies at the University of Amsterdam. During the project launch, Dr. yamomo will discuss the content of the research, introduce the Sonic Entanglements website, and present the trailer for the project’s podcast.